"Material Assumptions: Paper as Dialogue"
Ian Schneller, White Hornlet (2012), handmade cotton paper, mixed media, 19 x 19 x 5 inches. Photo: Rod Slemmons. “Material Assumptions” is a provocation to reconsider paper—specifically handmade paper, and its potential to support, hold and challenge form. The exhibition was developed through an independent study graduate course at Chicago’s Columbia College led by Jessica Cochran, who with co-curators Elizabeth Isakson-Dado, Hannah King, and C.J. Mace, invited more than a dozen artists to imagine new artworks to be made from abaca and cotton paper by graduate students at Columbia. These commissioned pieces complement the second part of the exhibition that showcases the work of artists in residence at Dieu Donné, a New York-based nonprofit paper workshop that has been providing opportunities for artists to engage with the process of handmade paper since 1976. Ian Schneller’s White Hornlets is a wonderful introduction to the premise of the show. Schneller is the man behind Specimen Products, a company that originated out of his sculptural work in the early 1980s. As a producer of guitars, amplifiers and speakers, the company is a testament to innovative acoustic aesthetics and experimentation in technology and design. 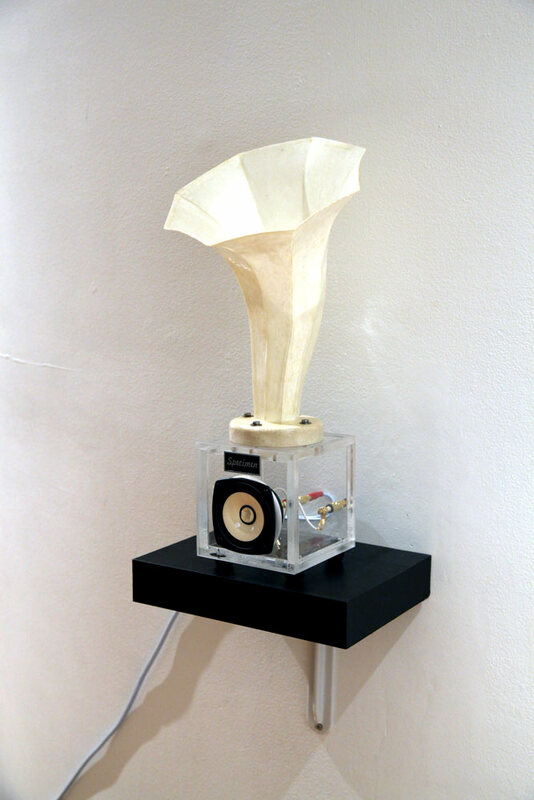 Here Schneller’s iconic speaker horns are made from handmade paper, resulting in ethereal white horns atop acrylic cubed bases. They assert clarity, transparency and purity, conceptually aligning themselves with a criterion of desired sound performance. Additionally, there were intriguing parallels between ancient formal histories of the horn as a vessel for sound amplification and paper as a carrier of information. While the form was a familiar one for Schneller, the properties of the handmade paper were new, as the horns are usually constructed out of “recycled newsprint, baking soda, and dryer lint,” and the change of material forced a shift in aesthetics. 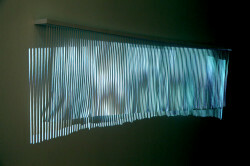 Annica Cuppetelli & Cristobal Mendoza, Double Interference (2012), handmade cotton paper, MDF, computer, video projector, camera, custom software. 25 1/2 x 4 3/4 x 80 inches. Photo: Rod Slemmons. For Daniel Luedtke’s Birthday Girl, Mace and Isakson-Dado provided the artist with a variety of papers and a list of instructions and ideas for how to approach the material. The result is a sculptural format enlisting a plethora of media that blur the roles of paper as support, construct and surface. 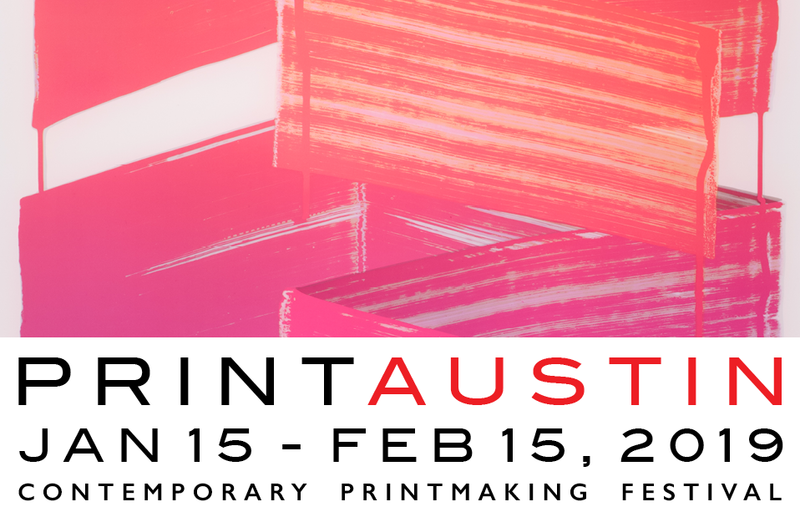 Annica Cuppetelli and Cristobal Mendoza’s Double Interference reveals layers of virtual and physical construction in its process and execution. Varying widths of the paper were laser-cut and affixed across MDF board. A video projector, camera, computer and software then respond to movements in proximity to the artwork, creating a doubling that manifested itself visually as a dialogue between materials and technology. A second gallery houses artworks from the Dieu Donné archive including memorable pieces by Mel Bochner, Ian Cooper, Matt Keegan, William Kentridge, and Richard Tuttle. 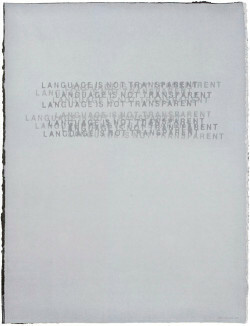 Watermarks were an unexpected thread in a number of works on display and lent marvelous results: Bochner’s Language is not Transparent (1999) (watermarked translucent abaca on black cotton) recalls investments in language as an artistic material and support, a proposition mirrored in the materiality of paper; while Kentridge’s Anne (2009) (watermarked cotton) is displayed in a lightbox illuminating its normally discreet surface. Both works are part of small editions, which led me to consider the watermark as a sign of authenticity and authority, another interesting correspondence when considering artworks that are prints or multiples. 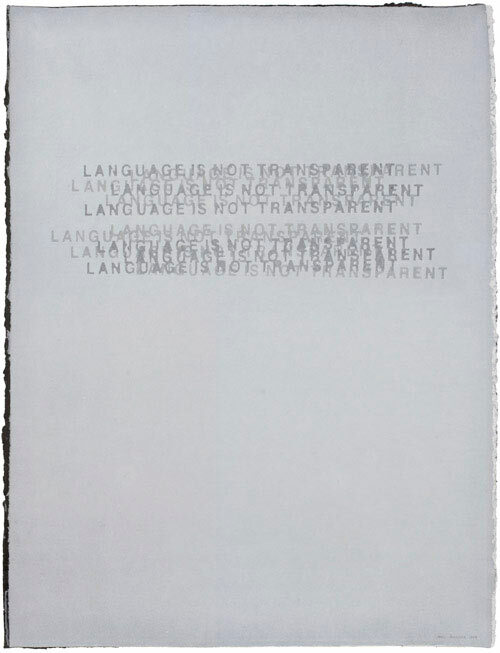 Mel Bochner, Language is Not Transparent (1999), watermarked translucent abaca on black cotton, 40 x 30 inches. 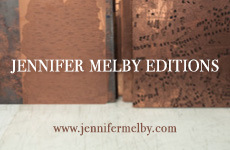 Edition of 16. Published by Dieu Donné, New York. Photo courtesy Dieu Donné, New York. While many of the Dieu Donné works approach paper as flat surface, there are some exciting sculptural forms that delight in paper as construct. Ian Cooper’s whimsical Chalice (2010) (handmade denim and cotton papers, commercial papers, fabric, cast paper pulp, trash bags, brush bristles, gloss medium, and jade adhesive) is an oversized baseball cap with long coarse looking tendrils attached. A rainbow with the word LOVE appears on the hat’s brim. Resting on a vitrine, Chalice appears as a transformative talisman from another dimension, a decorated object that imbues its wearer with unknown mythological powers. 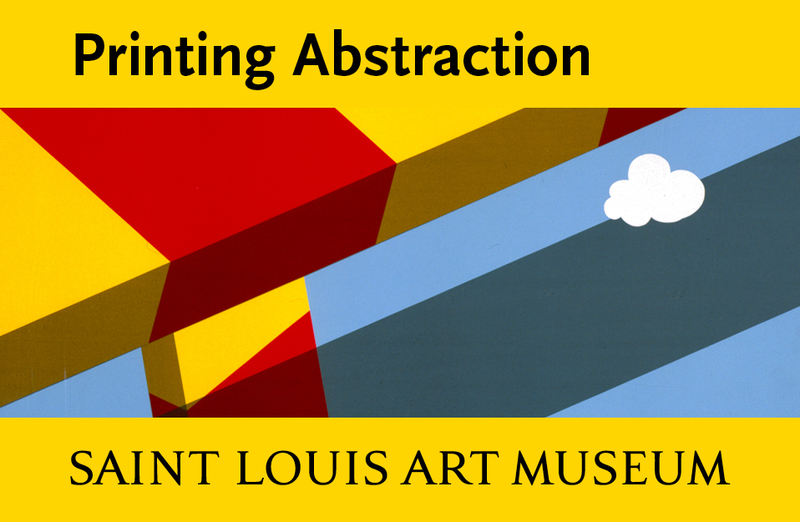 The Center for Book and Paper Arts consistently offers informative exhibitions that open up book and papermaking and their related aspects to a wider audience. The curatorial impetus behind “Material Assumptions” is impressive in its effort to create a dialogue not only between artist, artisan and curator, but also between the exhibition and its audience. It provides a platform from which to consider the incredible skill of papermakers as well as the interaction of materiality, content, and artistic practice.